For EMS workers, preparation is often the key to success. At Unitek EMT, we strive to not only prepare our students but our community as well. In 2014, Unitek hosted a mass-casualty simulation called Operation Urban Rescue. Not only were numerous agencies involved, but various Unitek students also participated in the event. This real-world disaster scenario provided EMT training, teamwork building between agencies, and a prepared emergency response on a large scale. Join us for another look at this groundbreaking EMS simulation. 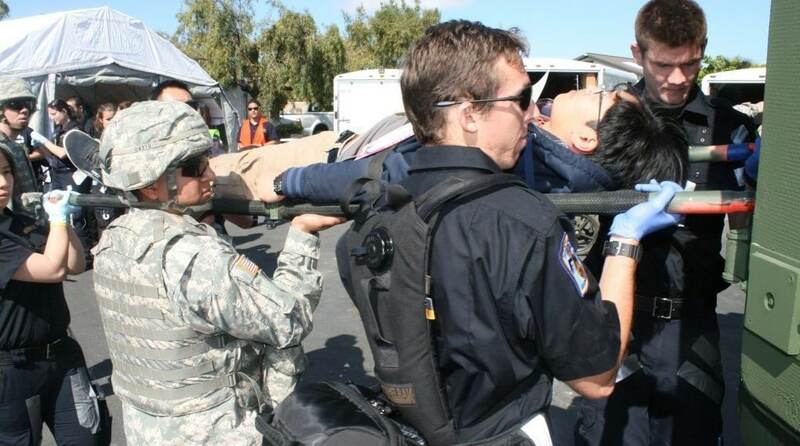 On April 5, 2014, Unitek EMT hosted Operation Urban Rescue, one of the largest multi-agency, mass-casualty training simulations held in the Bay Area. The primary goal of the event was to unify military and civilian response to a simulated domestic disturbance. Throughout the day, participants responded to the following emergencies: an armed insurgent threat, improvised explosive devices, hazardous materials, critical medical conditions, and a massive disaster scene. During an Operation Urban Rescue drill, the Fremont Police Department’s S.W.A.T. team took action to contain hazardous materials. Numerous volunteer patients also participated in a decontamination drill. Throughout the day, CALSTAR and the Sonoma County Sheriff’s Office transferred patients via helicopter for treatment in nearby Washington Hospital. Additionally, Unitek EMT students and instructors trained alongside military and civilian personnel in Operation Urban Rescue. They gained first-hand knowledge about treating critical injuries in a major disaster setting. Such an opportunity allowed Unitek students to practice their skills in a realistic environment before graduating from our program. Above all else, Unitek is proud to have organized this collaborative event that provided valuable training and enhanced the safety of the community as a whole. If you’re feeling inspired and you’d like to pursue EMT training, allow us to give you a brief overview of the EMT program at Unitek. Ultimately, we strive to prepare our students for a rewarding career in EMS. Seasoned EMS professionals provide students with vital knowledge and skills through a combination of expert lectures, applied training, and workshop-style classes. We believe these experiences greatly benefit our students and influence their success. If you’ve been searching for EMT basic training, we offer a program with several variations to better accommodate our students. These include a 14-Day Boot Camp1 and an Expanded Online Hybrid at our Fremont Campus in Northern California. We also offer a modified version of the Boot Camp at our facility in Chandler, Arizona. Both of our locations provide students with a comprehensive yet efficient EMT program. Follow your dreams with Unitek EMT!